Archaeologists in Pompeii have announced their latest find on Valentine's Day - a fresco of Narcissus, who loved only himself. The director of the site, Alfonsina Russo, said the "beauty of the rooms" in that discovery had made officials change their plans and search further. 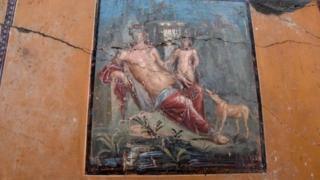 She said it was hoped the house, a wealthy residence near Pompeii's centre, might eventually open to the public. A press release from archaeologists described the fresco's surroundings as an "elegant and sensual" bedroom. "The extraordinary discoveries of this site continue," general director Massimo Osanna said in a statement. "This decoration was intentionally luxurious, and probably dated to the last years of the colony, as indicated by the extraordinary preservation state of the colours," he added. In Greek mythology, Narcissus was a hunter - born from the river god Cephissus and a nymph named Liriope. He was said to be impossibly handsome, but did not pursue any love interest presented to him - leaving behind a trail of devastated suitors. He is also where the term narcissism comes from - meaning an excessive interest in oneself.